Historical 17th Century Flemish Tapestry – Turco Persian Rug Company Inc. This fine 17th century Flemish Tapestry is woven in polychromatic dyed wool (with silk highlights) depicting a crowned Ancient Warrior with accompanying noblemen passing a golden statue to two priests standing on a staircase. This tapestry is a variation of the works of Peter Paul Rubens' (Flemish, 1577-1640) painting cycle of Roman Consul Decius Mus. There are existing tapestries similar to this one depicting Titus Manlius offering the plunders (gold statue) of war to Roman Senators. 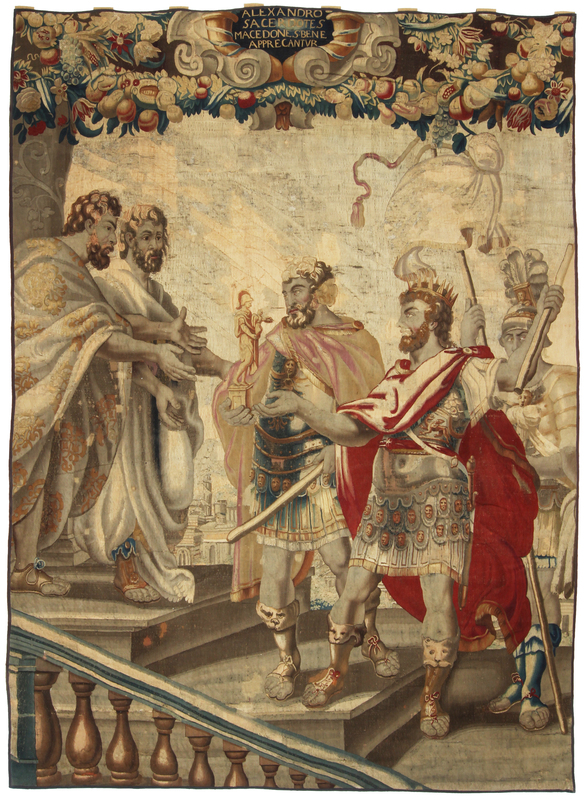 However, in this tapestry version it depicts Alexander the Great offering the plunders of war to Macedonian priests. The exceptional quality of the weaving is evident in the well-rendered facial expressions, musculature of the noblemen, and priests' drapery folds. This tapestry is reinforced with linen and has loops for mounting. Brass rod and finials are optional. By the early 16th century, the Netherlands was one of the unrivaled centres of tapestry production in Europe, with the majority of industry concentrated in Brussels (the kingdom of Belgium seceded from the Netherlands in 1830). Tapestry manufacturing was a highly organized and standardized business involving fine artists, weaver's guilds, large financiers, dealers and royal commissions. In addition to symbols of wealth and prestige, tapestries served functional purposes such as providing insulation for castle walls, covering openings and providing privacy in bedrooms. They were also regarded as valuable spoils of war. Very good condition, minor repairs. Actual Size 6' 2" x 8' 6"